A recent Energy Information Administration (EIA) report makes it clear that tremendous U.S. natural gas production growth is being led by three major shale plays: the Appalachian Basin in Ohio, Pennsylvania and West Virginia, the Permian Basin in Texas and New Mexico, and the Haynesville Shale in Texas and Louisiana. According to EIA, these record-breaking regions have grown from collectively representing about 15 percent of total U.S. natural gas production in 2007 to nearly 50 percent today. Thanks largely to surging output in these regions, monthly U.S. natural gas production has been more than 10 percent higher in 2018 than during the same months last year, with the EIA now projecting a record 81.1 Bcf/d this year —nearly 7 Bcf/d higher than the previous record set in 2015. The Appalachian Basin continues to dominate the U.S. natural gas scene as the driving force behind increased production since 2012. The region, which predominantly includes the Marcellus and Utica shales, has grown from virtually no natural gas production before 2009 to account for roughly 29 percent of U.S. totals in July 2018, with a daily output of just under 30 billion cubic feet (Bcf/d), according to EIA’s August drilling productivity report. The Appalachian Basin, or more specifically the western portion of the Basin – also known as the Shale Crescent USA – has driven growth in U.S. natural gas liquids (NGLs) production, as well. In fact, the U.S. Department of Energy (DOE) projects NGLs production will increase more than 700 percent in the region from 2013 levels by 2023. Texas and New Mexico’s Permian Basin is the most prolific U.S. shale play – and indisputably one of the most important plays in the world. Not only does the basin produce more than 11 Bcf/d of natural gas, or about 11 percent of total U.S. gross production in July – second only to the Appalachian Basin – but it is also driving U.S. oil production to record-obliterating levels. And it’s likely to continue to do so through 2019, with EIA recently projecting the Permian will produce an average 3.3 million barrels per day (b/d) in 2018 and 3.9 million b/d in 2019. If EIA’s August report is any indicator, the Permian may actually surpass those averages – August totals are projected to be just under 3.4 million b/d. 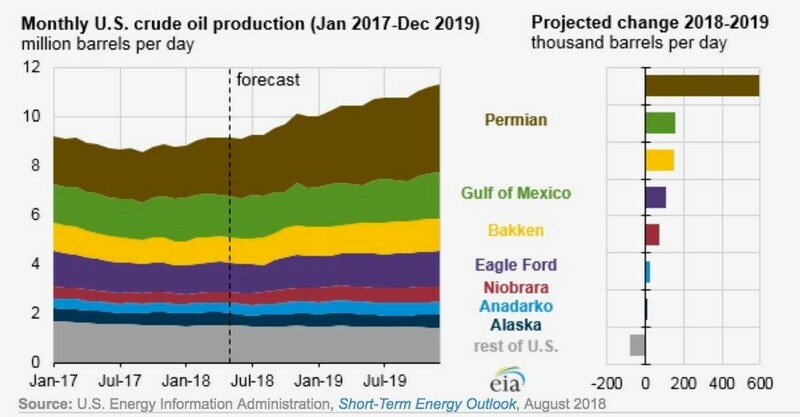 For perspective, the Eagle Ford and Bakken shales – the next two highest oil production plays – are projected to produce a combined 2.7 million b/d in August. Collectively, the Permian, Eagle Ford and Bakken are expected to drive U.S. oil production to 10.7 million b/d in 2018 and 11.7 million b/d in 2019. Those totals would surpass the previous production record set in 1970 by an incredible 1.1 and 2.1 million b/d, respectively. The remarkable oil and natural gas production from the Permian has unsurprisingly resulted in tremendous economic opportunities, with both states experiencing a combined $4 billion budget surplus in the current biennium. These dollar figures and production totals will likely surge as expected infrastructure build-out over the next few months allows for more oil and natural gas production. The Haynesville Shale in Texas and Louisiana is a play that many had written off after it dominated U.S. shale natural gas production from 2009 to 2012, but saw production drop off from 2013 to 2016. 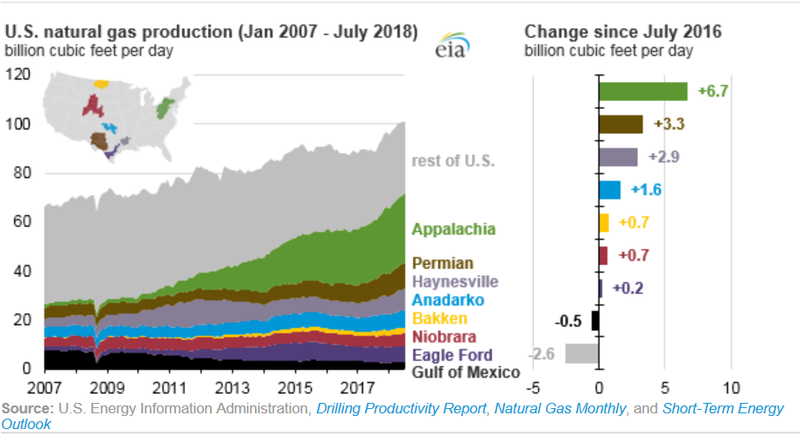 As EIA explains, an uptick in activity in late 2016 has led to the shale play accounting for about nine percent of total U.S. natural gas production in July with more than 9 Bcf/d in 2018. In fact, the Haynesville is actually the second largest U.S. natural gas shale reserve behind only the Appalachian Basin. The U.S. Geological Survey released an assessment of the play in 2017 that upped its estimated reserves to 1.1 billion barrels (BBbl) of oil, 195.8 trillion cubic feet (Tcf) of natural gas – triple the previous estimate of 61.4 Tcf – and 0.9 BBbl of NGLs. Over the last decade, U.S. oil and natural gas production has shattered previous records and propelled the United States into its current role as “the undisputed leader of oil and gas production worldwide,” according to International Energy Agency Executive Director Fatih Birol. And as EIA’s latest report shows, it’s being driven by the Appalachian Basin, Permian Basin and Haynesville Shale.